Embedded inside static television and radio relays, a clutter of sounds and colors of unknown origin floods the airways. Where the signal comes from is not important; its influence on unsuspecting recipients, however, has incredible-if-terrifying effects. Brainwashed by its veiled agenda, people find their reality skewed, enough that murder and savagery seem logical within their own damaged minds. A wave of chaos breaks out, with total panic dumping out any form of structured civilization. The Signal is one of the most creative, visceral horror movies in recent years—an exhausting experience where nothing of our known reality lingers, just the jumbled mishmash of distorted judgment and its ensuing bloodbath. Breaking down the film’s plot into a most simplistic form, you could say we’re watching a love triangle. We follow Ben (Scott Poythress) and Maya (Anessa Ramey), two lovers having an affair, unbeknownst to Maya’s husband Lewis (A.J. Bowen). When all hell breaks loose after the signal’s control has overtaken the fictional city of Terminus, Ben attempts to reach Maya amid the bedlam, while a crazed and murderous Lewis, far-gone from exposure to the broadcast, seeks out his wife in a jealous and vicious frenzy. Broken into three segments called “Transmissions”, each of the film’s three parts was helmed by a different writer-director. David Bruckner’s first segment “Crazy Love” derives from John Carpenter horror yarns like They Live and Ghosts of Mars, with a brooding sense of chaos frightening the lone Maya as she survives a world filled with faceless crazies. “The Jealousy Monster” is Dan Bush’s darkly comedic venture into surreality, centered almost exclusively in the abject and misaligning hallucinations of the signal’s victims, and punctuated with an onslaught of gory (yet strangely funny) slapstick violence. The final part, Jacob Gentry’s “Escape from Terminus” concludes the love triangle, bringing a deceptive sense of order to their otherwise shattered world. Bush’s second story is arguably the best, combining graphic brutality with undeniable hilarity. Inside a small apartment, the signal has driven yuppie wife Anna (Cheri Christian) to kill her yuppie husband just before their New Year’s Eve party. Now Anna waits for guests to arrive, her husband’s blood splattered about her face and fancy pink sweater. As a few survivors half-mad from the outside carnage hole-up with her (including the pointedly insane Lewis), an actual party guest, Jim (Chad McKnight), arrives for the festivities. Oblivious to, or perhaps in shock from the signal’s resulting bloodshed, Jim concerns himself with appeasing his unfulfilled libido, ignoring the dead body on the floor and the blood-soaked clothes of his fellow party guests. Meanwhile, it’s clear the apartment’s survivors have all been ravaged by “The Crazy” (none too far from England’s residents in 28 Days Later, infected with “rage”). After my screening of The Sinal, I felt an uncomfortable sense of displacement from reality, enough to have to tell myself “It’s only a movie.” What a paranoid feeling, unnerving to be sure. 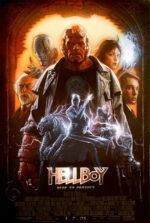 Spending the film’s duration in an assemblage of scenes with a spree of unscrewed characters, all of whom struggle with hallucination and brutal delusion, the viewer cannot help but become fried (in the most complimentary way possible) on the film’s ongoing sense of rupture. Indeed, a horror movie has not made me question if I should turn on the TV since David Cronenberg’s Videodrome, which is perhaps the best filmic example of technology’s unconscious penetration of the human mind. While putting forward that the transmissions release the human mind to violent suggestion, the film infers unrestricted human nature is sadistic at its core. 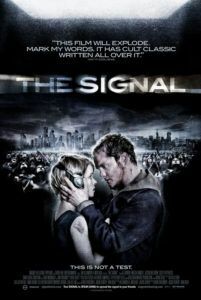 Viewers and listeners blankly zone into their televisions and radios in the film, absorbing the signal’s hidden message, opening up their minds to their own brainwashing; the allegorical commentary, complete with an ambiguous symbolic locale, leaves the story ripe for interpretation. But certainly, this film critiques the media’s effect on over-stimulated audiences. In Fullerton, CA recently, two men were stabbed by another patron during a screening of The Signal. According to reports, a yet unknown assailant stabbed his AMC Theater seat several times, moved on to stabbing a nearby movie patron, and then on his way out stabbed another audience member near the exit, finally fleeing the scene before police could catch him. 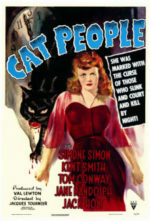 While both victims are expected to make a full recovery, the incident fuels mild hysteria (and without a doubt, clever marketing) around the film, as though subliminal messaging exists within the film’s frames. Then again, we might ask why the attacker brought a knife to his screening in the first place… Could this be yet another case of a Hollywood studio resorting to audience-unfriendly marketing ploys—like when Disney distributed poison apples to consumers when promoting its home video re-release of Snow White and the Seven Dwarves? (No, not really.) Whether inspired by the film or not, this incident offers an interesting potential real-life parallel. Low-budget horror, even when it does well on the festival circuit, usually finds its way onto Blockbuster’s direct-to-video shelves, forgotten for all time, or at least until some bored horror junkie decides to take a risk and rent something like Right at Your Door. Despite being a small, independently produced shocker, The Signal impressed Magnolia Pictures’ executives enough at the Sundance Film Festival to deem acquisition for theatrical distribution. While press remains virtually nonexistent and theater exposure almost nil, you may have to seek this one out. But I assure you, horror fans will be wowed by its unrelenting intensity, dizzying unrealities, and constant graphic, affecting shocks.